Our home in Alamogordo had the familiar arrangement for homes of its size and era: a stall shower in the master bathroom and a tub c​um shower in the "general" bathroom. Of course Carla and I have not been in a bathtub for years; were I to get into one, it wouild probably take a visit by the Rescue Squad to get me out. I normally use the shower in the master bathroom, and Carla the tub c​um shower in the general bathroom. And of course it is rather a compromise as a shower. So recently we had a contractor rip out the bathtub and its enclosure and replace it with a lovely stall shower. As we planned the job, Carla said that, even though a "bypass sliding door" is common on stall showers, she would rather have this set up for a shower curtain., The advantage is that it is much easier for her to clean the shower (and to not clean the doors). So we went that way. The result is superb, and Carla really enjoys it. My stall shower is very nice, but fairly small (about 40 inches across the opening) and so the sliding doors are fairly small - a matter exacerbated by the fact that the original builder didn't care to get custom doors the right size for this slightly unusual size shower. Thus the doors are for a 44" shower, and as a result, overlap more than is intended and leave an opening that is even smaller than the size of the shower would dictate. Carla suggested that instead we should probably go the same route we went for the other shower - remove the existing bypass sliding doors and replace them with a curtain. Again, one object was to facilitate cleaning the shower (which Carla does, by the way). I agreed. Carla said she would shop for a nice shower curtain and get it for me for my birthday. Ah, the wisdom of the Cherokee! Why on earth is she horizontal? Maybe there was an orientation flag set in the Exif metadata. Let me look into that (I thought I had that turned off in that camera, but sometimes I get confused!). I need to check the camera and see why that even happened. Well, evidently I can't disable the orientation flag on that camera (Canon G16). I will have to be sure to clear it in the Exif when I process the metadata. 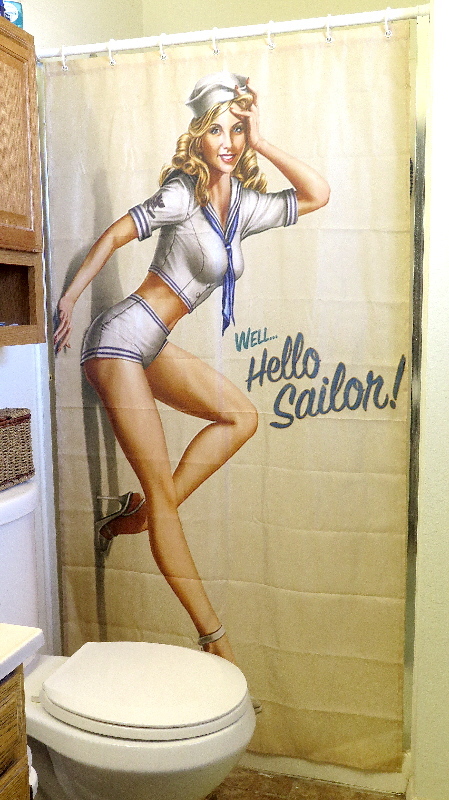 For sure, this is the most comely and well-adorned shower curtain and shower curtain girl! That sailor, in the famous VE Day WWII "Kiss", would have abandoned the girl in his arms for this lassie!